Fury Kapcori, a grade 3 stakes winner and Grade 1-placed son of leading sire Tiznow, has been retired from racing and will stand the 2016 breeding season at Brent and Crystal Fernung’s Journeyman Stud. A top performer and stakes winner as a juvenile, Fury Kapcori finished a close second to Violence in the CashCall Futurity (G1) at Hollywood Park. Stakes-placed at 3, Fury Kapcori romped by 5 ½ lengths in Santa Anita’s Precisionist Stakes (G3) and recorded five consecutive triple-digit Beyer Speed Figures, including a 107 in winning the Santana Mile and a 103 when second as the odds-on favorite in the Californian Stakes (G2), during a five-race span that included a four-race win streak as a 4-year-old. A winner in 6 of 18 starts lifetime for trainer Jerry Hollendorfer, with earnings of $521,040, Fury Kapcori, in a distinguished racing career defeated Preakness Stakes (G1) winner Oxbow, Grade 1 winner Majestic Harbor, Grade 2 winner and millionaire Clubhouse Ride, Grade 2 winner Handsome Mike (twice) and Breeders’ Cup Juvenile (G1) runner-up He’s Had Enough, among others. 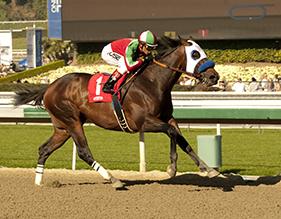 Campaigned by Hollendorfer in partnership with Rick Awtrey and George Todaro, Fury Kapcori is produced from the stakes-producing Go For Gin mare Gin Running, who is also the dam of Grade 2 winner Tizfiz and Turf Paradise Derby winner Dixie Commander, from the family of Horse of the Year Favorite Trick. Bred by Diamond A Racing Corp., Fury Kapcori was a $100,000 Keeneland September yearling sale graduate for Hollendorfer, who bought him from Taylor Made Sales Agency. Square Dancer Wins Redekop Classic H.